1. ARIA:Sheppard Ave. and Leslie St. Builder: Fernbrook Homes, Menkes and Cityzen Development. Tower 1 is 18 storeys with 298 units. Tower 2 is 16 storeys with 250 units. Prices: from $419,900 for 840 sq. ft. Higher price and square footage undisclosed. Fees: 45 cents per sq. ft., plus hydro. Amenities: indoor swimming pool, whirlpool, his and hers change rooms, party room with caterers kitchen and wet bar, games room with billiard and card tables, exercise/aerobics room, virtual golf room with putting green, fully equipped media room and outdoor terrace/sundeck with barbecue area. Sales: 95 per cent sold. Status: under construction. Occupancy: Phase 1 November 2010; Phase 2 January 2011. 2. THE AVANTI CONDOMINIUMS:Sheppard Ave. W. west of Bathurst. A nine-storey, terraced building of precast/stucco and glass with 115 units. Builder: Torbel Group. Prices: from $229,900 for 550 sq. ft to $524,900 for 1,315 sq. ft. Fees: 35 cents per sq. ft., plus hydro and gas. Amenities: party room, exercise room and rooftop terrace. Sales: 50 per cent sold. Status: construction starting winter 2010. Occupancy: June 2012. 3. AVONSHIRE TOWNHOMES:Yonge St. north of Highway 401. Builder: Tridel. A limited collection of 51 townhouses with landscaped patios or private rooftop terraces. Prices: from $579,000 for 1,674 sq. ft. to $909,000 for 2,487 sq. ft. Fees: 27 cents per sq. ft., plus heating, cooling, hydro and hot water. Amenities: shuttle bus service to Sheppard subway station. Sales: 70 per cent sold. Status: under construction. Occupancy: summer 2011. 4. AVONSHIRE:Yonge St. north of Highway 401. Builder: Tridel. Two twin 21-storey towers connected by a shared central podium with 456 units in total. Prices: from $303,000 for 672 sq. ft. to $1,175,000 for 2,083 sq. ft. Fees: 43 cents per sq. ft., plus heating, cooling, hydro and hot water. Amenities: two storey lobby, boardroom, indoor swimming pool, whirlpool, outdoor deck, men’s and women’s sauna, fitness centre, theatre, guest suites, terraces, party room, billiard room and private dining room. Sales: 90 per cent sold. Status: under construction. Occupancy: spring 2010. 5. THE BAYVIEW:Bayview Ave. south of Sheppard Ave. Builder: The Daniels Corp. A nine-storey precast concrete building and a four-storey building with 101 units. Prices (parking and locker included): from $453,900 for 799 sq. ft. to $824,900 for 1,413 sq. ft. Fees: 54 cents per sq. ft., plus hydro. Amenities: library, fitness studio, home theatre, party room, terrace, executive concierge and access to the amenities at Amica at Bayview Gardens. Sales: over 50 per cent sold. Status: built and registered. Occupancy: immediate. 6. BELLAIR GARDENS AT YORK MILLS:18 Valley Woods Rd., Don Valley Parkway and York Mills Rd. Builder: Castle Group Ventures. A modern mostly glass, 167-unit building with 11 storeys in the front and 14 storeys in the back. Price (parking included): $539,990 for 1,440 sq. ft. Fees: 49 cents per sq. ft., plus hydro Amenities: concierge, media room, yoga room, Internet room with library, exercise room and multi-purpose party room with walkout to garden and barbecue area. Sales: one left. Status: built. Occupancy: immediate. 7. BRAVO BOUTIQUE CONDOMINIUMS:Norton Ave. east of Yonge St. Builder: Pemberton Group in collaboration with Baywood Homes. A 19-storey building. Prices (parking and locker included): from $323,800 for 580 sq. ft. to $614,800 for 1,100 sq. ft. Fees: 45 cents per sq. ft. Amenities: party room with fireplace and a catering kitchen, state-of-the-art theatre, billiards room and gym with change rooms and showers. Status: under construction. Occupancy: March 2012. 8. DISCOVERY AT CONCORD PARK PLACE:Provost Dr. south of Sheppard Ave. E. Builder: Concord Adex. Two 28-storey precast concrete buildings with over 600 units plus about 30 townhouses. Prices: from $295,000 for 700 sq. ft. to $810,000 for 2,176 sq. ft. Fees: about 45 cents per sq. ft., plus hydro. Amenities: indoor pool, guest suites, party room, kids play area, yoga room, badminton court, lounge, whirlpool, pet spa, steam rooms, saunas, two terraces and 24-hour concierge. Sales: about 95 per cent sold. Status: under construction. Occupancy: June 2011. 9. EMERALD CITY 2: Sheppard Ave. E. and Don Mills Rd. Developer: ELAD Canada. A 29-storey tower with 404 suites. Prices: from the mid $200,000s for a 1 bedroom and over $500,000s for a penthouse suite Fees: 50 cents per sq. ft., plus hydro. Amenities: 24-hour concierge, yoga studio, gym, indoor swimming pool and whirlpool, landscaped terrace, party room, entertainment area, movie screening room, barbecue area. Status: construction not started. Occupancy: June 2014. 10. EMERALD PARK:Yonge St. south of Sheppard Ave. Builder: Bazis Inc. Two luminous green leaning towers, 32 and 42 storeys with 450 units in total. Prices: from $339,900 for 611 sq. ft. to $1,269,900 for a penthouse with over 2,000 sq. ft. Fees: 49 per sq. ft., plus hydro. Sales: over 80 per cent sold. Status: construction to start this year. 11. ST. GABRIEL TERRACES:650 Sheppard Ave. E. Builder: Shane Baghai. An eight-storey, 169-unit building with a custom coloured precast concrete exterior. Prices: from $271,000 for a 430 sq. ft. studio to $720,000 for 1,290 sq. ft. Fees: 69 cents per sq. ft., plus hydro. Amenities: exercise room, saunas, boardroom, party room with kitchenette and landscaped terrace area, games room, office room. Sales: four left. Status: built and registered. Occupancy: immediate. 12. ST. GABRIEL MANOR:676 Sheppard Ave. E. east of Bayview Ave. Builder: Shane Baghai. An eight-storey, 96-unit building with an exterior of brick with stone detailing. Prices: from $404,000 for 705 sq. ft. to $587,000 for 1060 sq. ft. Fees: 44.5 cents per sq. ft., plus hydro. Amenities: boardroom, dining room with kitchenette, landscaped terrace and exercise room. Sales: 39 left. Status: under construction. Occupancy: spring 2011. 13. GIBSON SQUARE CONDOMINIUMS: Park Home Ave. and Yonge St. Builder: Menkes Developments. Two 42-storey glass towers with 900 units and a 5-storey glass and brick podium. Prices: from $316,990 for 567 sq. ft. to $1,144,990 for 1,787 sq. ft. Fees: South Tower 44 cents per sq. ft., plus hydro; North Tower 48 cents per sq. ft., plus hydro. Amenities: 24-hour concierge, indoor pool with outdoor terrace, fitness centre, weight and cardio areas, yoga and aerobics room, saunas, two party rooms with rooftop garden, theatre room, games room, mah jong and bridge room and four guest suites. Sales: South Tower 75 per cent sold; North Tower 60 per cent sold. Status: construction starting early 2011. Occupancy: South Tower October 2013; North Tower March 2014. 14. GRAMERCY PARK CONDOMINIUM RESIDENCES:525 Wilson Ave. west of Bathurst St. Builder: Malibu Investment Inc. A U-shaped building with six storeys, nine storeys and 12 storeys, with 511 units in total. Prices (parking included): from $189,990 for 452 sq. ft. to $710,000 for 1,655 sq. ft. with an 800-sq.-ft. terrace. Fees: 43 cents per sq. ft., plus hydro. Amenities: 24-hour concierge, pet spa, fitness room, yoga room, indoor pool, whirlpool, sundeck, party room, guest suites, private dining room, theatre room and games room. Sales: 76 per cent sold. Status: construction started. Occupancy: fall of 2011. 15. HARMONY VILLAGE ON THE HUMBER RIVER:Finch Ave. east of Islington Ave. Builder: Willowfield Homes. Eleven four-storey buildings with a total of about 315 townsuites and 60 townhouses. Prices (parking and locker included): townsuites, $274,900 for 1,245 sq. ft. to $293,900. Fees: between $96-$115 per month, plus heat and hydro. Sales: one left; townhouses, sold out. Status: built. Occupancy: 30 to 90 days. 16. HILLSIDE AT YORK MILLS 3:William Carson Cres., Yonge St. and York Mills Rd. Builder: State Building Group. An eight-storey red brick building with 162 units sitting in a reverse ravine. Prices (two parking spaces and two lockers included): from $349,900 for 750 sq. ft. to $669,900 for 1,410 sq. ft. Fees: over 60 cents per sq. ft. (cable TV included). Amenities: indoor pool, Jacuzzi, whirlpool, sauna, workout area, billiards room, library, putting green, party room, billiards room, boardroom, two guest suites, indoor exercise area, 24-hour concierge and gatehouse. Sales: 95 per cent sold. Status: built and registered. Occupancy: immediate. 17. HULLMARK CENTRE:Yonge St. and Sheppard Ave. Builder: Tridel Hullmark. A two tower condominium development of 682 units with an office component, premium retail fronting onto a public plaza. Prices: from $524,500 for 940 sq. ft. to $1,445,000 for 2,147 sq. ft. Fees: 43 cents per sq. ft., plus heating, cooling, hydro and hot water. Amenities: outdoor swimming pool, whirlpool, outdoor cabanas, terrace, fireplace lounge, media room, party room, steam and sauna rooms, cards room, theatre, fitness centre, boardroom, billiards room. Sales: 99 per cent sold. Status: under construction. Occupancy: spring 2013. 18. LUXE CONDOMINIUMS:Yonge St. north of Finch Ave. Builder: Menkes Developments. Two precast concrete and glass towers, 24-storeys with 199 units and a 22-storey building with 190 units. Prices: $375,990 for 825 sq. ft. Fees: 42 cents per sq. ft., plus heat and hydro. Amenities: 24-hour concierge, indoor pool, saunas, exercise room, party room, billiards room, card room, theatre room, lounge, reading room with WiFi, landscaped outdoor lounge with WiFi and two guest suites. Sales: one left. Status: built and registered. Occupancy: immediate. 19. MERCI LE CONDOMINIUM:Sheppard Ave. east of Bayview Ave. Builder: The Daniels Corp. A seven-storey French-inspired building with 160 units. Price (parking included): $456,900 for 843 sq. ft. Fees: 54 cents per sq. ft., plus and hydro. Amenities: executive concierge, games room, fitness studio, party room with catering kitchen, bar, formal dining area and double-sided fireplace, outdoor terrace, club with Internet stations, coffee bar and flat-screen TV and theatre. Sales: one left. Status: built and registered. Occupancy: immediate. 20. METRO PLACE CONDOS:Allen Rd. and Sheppard Ave. W. Builder: Liberty Development Corp. Metropolis and Parkside Tower, two mostly glass buildings, one 16 storeys with 303 units, the other is a 15 storeys building with 229 units. Prices: from $253,000 for 640 sq. ft. to $491,000 for 1,215 sq. ft. Fees: 46 cents per sq. ft., plus hydro. Amenities: exercise room, indoor pool, whirlpool, saunas, change rooms, and an indoor golf simulator. Sales: Metropolis 80 per cent sold; Parkside Tower 70 per cent sold. Status: under construction. Occupancy: Metropolis April 2012; Parkside Tower April 30, 2012. 21. THE PALM:Yonge. St. north of Finch Ave. Builder: Castle Royal Development Ltd. A 23-storey, 216-unit glass and precast concrete building. Prices (parking included): from mid-300,000s for 595 sq. ft. to the mid-$400,000s for 823 sq. ft. Fees: 49 cents per sq. ft., plus hydro. Amenities: executive concierge, private garden terrace, lounge, fitness area, hydro spa, indoor pool, sun tanning deck, multi-purpose room with catering kitchen, private dining room/boardroom/business centre and 24-hour concierge. Sales: about 75 per cent sold. Status: under construction. Occupancy: November 2011. 22. PEARL CONDOMINIUMS:Yonge St. north of Sheppard Ave. Builder: The Conservatory Group. A 24-storey glass and precast concrete tower with townhouses and penthouses with 351 units in total. Prices: from $324,900. Highest price and square footage undisclosed. Fees: 39.5 cents per sq. ft., plus hydro. Amenities: indoor pool, whirlpool, his/hers change rooms and sauna, cinema, billiards room, exercise room, card room, party room, conference room, library, 24-hour concierge and guest suite. Sales: undisclosed. Status: under construction. Occupancy: estimated February 2011. 23. PEARL 2:Yonge St. north of Sheppard Ave. Builder: Conservatory Group. A 34-storey building. Prices: N/A. Fees: N/A. Amenities: N/A. Sales: coming soon. Status: construction not started. Occupancy: N/A. 24. PORTRAIT CONDOMINIUMS:Sheppard Ave. W. west of Bathurst St. Builder: Norstar Developments. Two eight-storey buildings joined by a four storey podium with 188 units. Prices (parking included): from the low $270,000s for 630 sq. ft. to $700,000 for 1,760 sq. ft. Fees: about 46 cents per sq. ft., plus hydro. Amenities: party room with fireplace, outdoor patio, dining room with catering kitchen, billiards room with large-screen TV, fitness area, yoga/stretch room, steam rooms, guest suite, pet spa, potting room, rooftop deck with outdoor kitchen and 24-hour concierge. Sales: 72 per cent sold. Status: under construction. Occupancy: Spring 2012. 25. 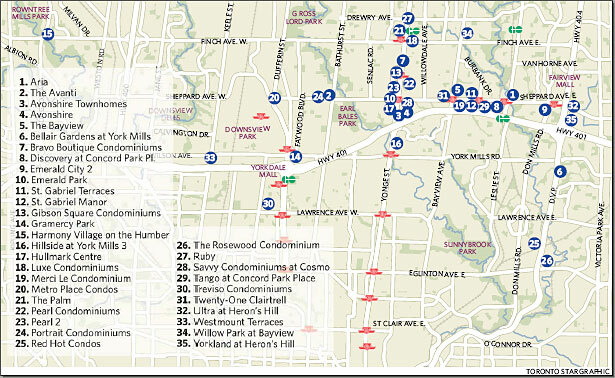 RED HOT CONDOS – FINAL PHASE:Lawrence Ave. E. and Don Mills Rd. Builder: Camrost/Felcorp. A nine-storey, 110-unit brick and glass building. Prices: from $198,900 for 500 sq. ft. to $302,900 for 760 sq. ft. Fees: 49 cents per sq. ft., plus hydro. Amenities: indoor pool, exercise room, event room, media lounge, 24-hour concierge, garden terrace, cards/billiards room, guest suite and yoga/aerobics studio. Sales: 60 per cent sold. Status: under construction . Occupancy: fall 2011. 26. THE ROSEWOOD CONDOMINIUM:133 and 135 Wynford Dr. Builder: Greenpark Homes. Two towers, one 25 storeys and one 21 storeys with 356 units in total. Prices (two parking spaces and locker included): from $529,900 for 1,127 sq. ft. to $682,900 for 1,712 sq. ft. Fees: 43.5 cents per sq. ft., plus hydro. Amenities: 24-hour concierge, fitness club, steam rooms, guest suites, lounge, card and billiards room, party room with kitchen and conference room. Sales: North Tower sold out; South Tower five left. Status: built and registered. Occupancy: 60 days. 27. RUBY:Yonge St. and Drewry Ave. Builder: Conservatory Group. A highrise building and townhouses. Prices: N/A. Fees: N/A. Amenities: N/A. Sales: coming soon. Status: construction not started. Occupancy: N/A. 28. SAVVY CONDOMINIUMS AT COSMO:Glendora Ave., Yonge St. south of Sheppard Ave. Builder: Menkes Developments. A 22-storey precast concrete and glass building with 290 units. Prices: from $439,990 for 840 sq. ft. to $528,990 for 1,030 sq. ft. Fees: 42 cents per sq. ft., plus heat and hydro. Amenities: 24-hour concierge, indoor pool, fitness centre, party room with outdoor terrace, private dining room, theatre room, card room and two guest suites. Sales: 80 per cent sold. Status: under construction. Occupancy: May 2012. 29. TANGO AT CONCORD PARK PLACE:Provost Dr. south of Sheppard Ave. E. A 28-storey precast concrete building with 370 units and 14 townhouses. Builder: Concord Adex. Prices: from $250,000 for 570 sq. ft. to $487,000 for 968 sq. ft. Fees: 48 cents per sq. ft. plus hydro. Amenities: party room, exercise room, guest suites, lounge, whirlpools, barbeque area, outdoor patio, 24-hour concierge. Sales: about 75 per cent sold. Status: construction not started. Occupancy: December 2013. 30. TREVISO CONDOMINIUMS:Dufferin St. and Lawrence Ave. W. Builder: Lanterra Developments. Two eight-storey buildings, one with a tower component that rises to 20 storeys. Phase 1 will have 423 units. The community will eventually have 1,500 units. Prices: from the low $200,000s for 480 sq. ft. to $559,900 for 1,232 sq. ft. Fees: 50 cents per sq. ft. plus hydro. Amenities: 24-hour concierge, party room, dining room, hosting kitchen, terrazzo, fitness centre, boardroom, outdoor swimming pool, hot tub, lounge with barbecue and dining areas, gardening plots for specific suites. Sales: just opened. Status: construction not stated. Occupancy: fall 2014. 31. TWENTY-ONE CLAIRTRELL:Sheppard Ave. E. west of Bayview Ave. Builder: The Rockport Group. A seven-storey building with 128 units. Prices: from $294,900 for 511 sq. ft to $677,900 for 1,231 sq. ft. Fees: 48 cents per sq. ft. plus hydro and water. Amenities: cardio room, guest suite, lounge and rooftop terrace. Sales: over 50 per cent old. Status: construction starting spring 2011. Occupancy: starting September 2012. 32. ULTRA AT HERON’S HILL: Sheppard Ave. E. and Don Mills Rd. Builder: Monarch Corp. A 38-storey tower with a five-storey podium with 413 units. Prices: from $313,990. Fees: 47 cents per sq. ft., plus hydro. Amenities: party room, fitness room, his and hers saunas, sports lounge, theatre, guest suites, car wash bay and 24 hour concierge. Sales: 95 per cent sold. Status: under construction. Occupancy: June 2012. 33. WESTMOUNT TERRACES:2737 Keele St. south of Wilson Ave. Builder: Westmount-Keele Limited. A 10-storey stucco building with 164-units. Prices (parking and locker included): from $158,800 for 560 sq. ft. to $429,000 for 1,250 sq. ft. Fees: 36 cents per sq. ft. Amenities: party room and gym. Sales: 70 per cent sold. Status: construction not started. Occupancy: fall 2011. 34. WILLOW PARK AT BAYIVEW:Finch Ave. E. and Bayview Ave. Builder: The Brown Group of Companies Inc. A nine-storey brick building with 75 units. Prices: from $446,990 for 927 sq. ft. to $729,990 for 1423 sq. ft. Fees: about 50 cents per sq. ft., plus hydro. Amenities: executive concierge, party room, fitness centre and furnished guest suite. Sales: 60 per cent sold. Status: under construction. Occupancy: expected April 2012. 35. YORKLAND AT HERON’S HILL: Sheppard Ave. E. and Don Mills Rd. Builder: Monarch Corp. A 30-storey tower with a three-storey podium, with 366 units. Prices: from $198,490 for 397 sq. ft. to $378,990 for 876 sq. ft. Fees: 51 cents per sq. ft., plus hydro. Amenities: party room with billiards table and private dining area, fitness room, his and hers saunas, theatre, guest suites, car wash bay and 24 hour concierge. Residents have access to a shared recreation complex with indoor swimming pool, whirlpool, steam rooms, landscaped rooftop terrace. Sales: over 80 per cent sold. Status: construction not started. Occupancy: September 2013. If any of these projects interest you, please contact me to get more information or to set up an appointment.